Architect’s rendering shows the proposed rail platform adjacent to the DL&W complex on South Park Avenue. The recent study of possible Metro Rail expansion commissioned by the Niagara Frontier Transportation Authority demands further examination, and then the federal dollars necessary to implement the plan selected. The payoff, under one plan, would see Buffalo Sabres fans on their way to First Niagara Center stopping first at a redeveloped Delaware, Lackawanna & Western Railroad Terminal across the street, where they would be able to patronize shops and restaurants and then cross a skywalk to attend the game. The other plan, less comprehensive, would also extend Metro Rail to Michigan Avenue. Either would also serve Bills fans heading for what could be a new downtown stadium now in the earliest stages of planning. The team jerseys are different but the goal for the NFTA is the same: move large numbers of riders efficiently. When the Metro Rail system was planned, there was no need for it to go beyond the foot of Main Street. That has changed in the past few years, and now there is so much excitement and development around Canalside and the Cobblestone District that an expanded public transportation system has become a requirement. Such an expansion will cost millions of dollars, and that is where federal dollars have a huge role to play. Metro Rail needs to expand in order to better serve its customer base, including sports fans and the increasing numbers of workers downtown. With the swiftly increasing crowds now traveling to the waterfront for summer concerts, winter ice skating and many other activities, the NFTA took the proper steps in weighing its possibilities, and the limits to its funding. It will take millions of dollars to make any expansion a reality. But with downtown development continuing at a furious pace and more people living, working and playing there, a once-inconceivable critical mass is being created. Because of that, Metro Rail’s deficiencies are becoming more and more obvious. NFTA officials are well aware that their service needs to evolve. The question is how to get there. The NFTA decided to map out possible expansion routes and commissioned a $300,000 transit study conducted by Parsons Brinckerhoff. The firm surveyed developers in the area, the City of Buffalo, Erie Canal Harbor Development Corp., the state Department of Transportation and the Sabres. Out of that effort, five options were drawn up, with two deemed worthy of continued study. 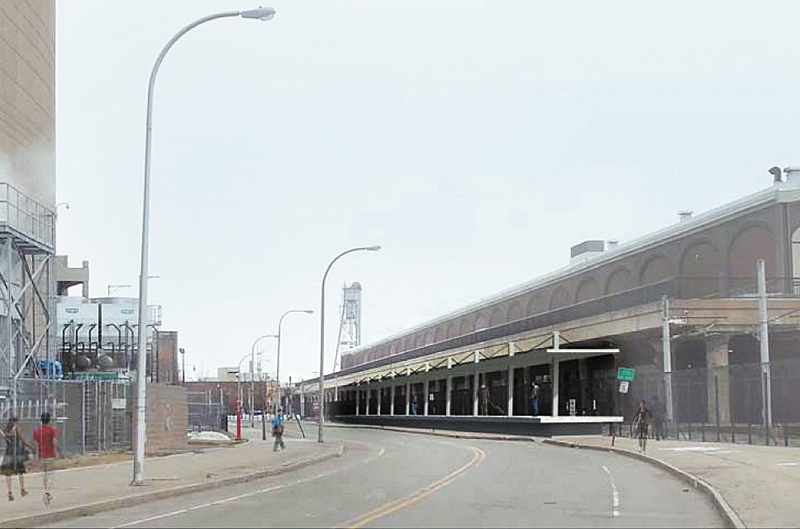 One of those options sends Metro trains along the DL&W Terminal’s ground floor on the Buffalo River side, where stairs and escalators could convey passengers to hoped-for new development on the second floor. The other option calls for a new station on the DL&W Terminal’s downtown side along South Park Avenue. The study also concludes that Metro Rail’s current Erie Canal Harbor Station does a good job for that immediate area, but will not be so useful when it comes to future development. The agency would need to look past the current end of the tracks, where new development is expected to take place. The NFTA is doing its due diligence by studying the much more extensive rail expansion from University Station into Amherst as well as a short extension downtown that would leverage the Canalside and Cobblestone District development. As downtown continues to grow, extending that end of the line is looking more and more like a necessity. With any project likely to take at least three to five years to complete, now is the time to plan. The NFTA is right in preparing for future demands on the system.